More than 100 families in the 2018 California fires are impacted by autism. These families may have lost everything. Recognizing the extraordinary challenges these families experience (loss of a home, products and need for treatment services), Autism Care Today has dedicated this fund to assist these families. Tomorrow is GivingTuesday, the biggest day of the year for online donations. Be a hero and make a donation for families impacted by autism and the fires. 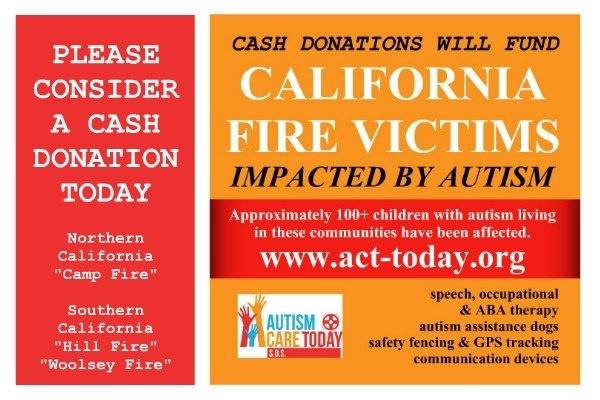 Autism Care Today has dedicated $3,000 towards the California fire victims affected by autism. Please join our campaign.